The transition to 100% renewable energy must take place within about a century because fossil fuels will become too rare and expensive to burn. But scientists warn that if the transition does not happen much faster than that, there is a danger that we may reach a tipping point beyond which feedback loops could take over and produce a catastrophic increase in global temperature. The melting of Arctic sea ice is taking place far more rapidly than was predicted by reports of the Intergovernmental Panel on Climate Change (IPCC). David Wasdell, Director of the Apollo-Gaia Project, points out that the observed melting has been so rapid that within less than five years, the Arctic will be free of sea ice at the end of each summer. It will, of course continue to refreeze during the winters, but the thickness and extent of the winter ice will diminish. It has also been observed that both the Greenland ice cap and the Antarctic ice shelves are melting much more rapidly than was predicted by the IPCC. Complete melting of both the Greenland ice cap and the Antarctic sea ice would raise ocean levels by 14 meters. It is hard to predict how fast this will take place, but certainly within 1-3 centuries. Most worrying, however, is the threat that without an all-out effort by both developed and developing nations to immediately curb the release of greenhouse gases, climate change will reach a tipping point where feedback loops will have taken over, and where it will then be beyond the power of human action to prevent exponentially accelerating warming. 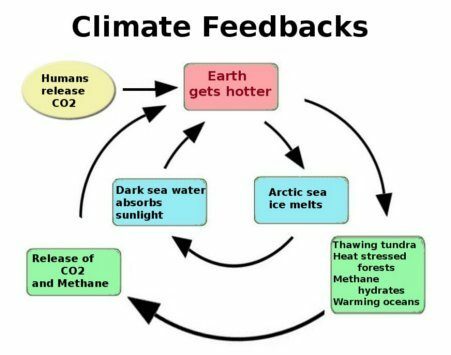 By far the most dangerous of these feedback loops involves methane hydrates or clathrates. When organic matter is carried into the oceans by rivers, it decays to form methane. The methane then combines with water to form hydrate crystals, which are stable at the temperatures and pressures which currently exist on ocean floors. However, if the temperature rises, the crystals become unstable, and methane gas bubbles up to the surface. Methane is a greenhouse gas which is much more potent than CO2. 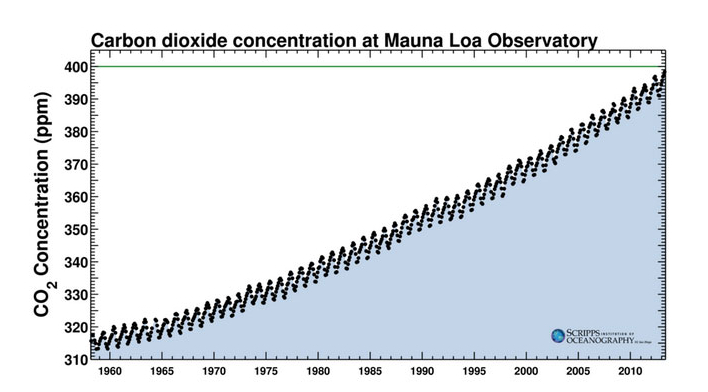 Figure 1: Despite the efforts of scientists to warn of the dangers of runaway climate change, the atmospheric concentration of CO2 continues to increase steadily. We need more public debate of the dangers, and a sense of urgency. Geologists studying the strata of rocks have observed 5 major extinction events. These are moments in geological time when most of the organisms then living suddenly became extinct. The largest of these was the Permian-Triassic extinction event, which occurred 252 million years ago. In this event, 96 percent of all marine species were wiped out, as well as 70 percent of all terrestrial vertebrates. The Permian-Triassic thermal maximum seems to have been triggered by global warming and CO2 release from massive volcanic eruptions in a region of northern Russia known as the Siberian Traps. The amount of greenhouse gases produced by these eruptions is comparable to the amount emitted by human activities today. Figure 2: There is a danger that a runaway methane hydrate feedback loop might initiate a 6th geological extinction event. The great and complex edifice of human civilization is a treasure whose value is almost above expression; and this may be lost unless we give up many of our present enjoyments. Each living organism, each animal or plant, is a product of three billion years of evolution, and a miracle of harmony and complexity; and most of these will perish if we persist in our folly and greed. 3. Is a shift to 100% Renewable Energy Possible? One answer to the question of whether a shift to 100 percent renewable energy is possible is that it has to happen during this century because fossil fuels are running out. Within a century or so they will be gone in the sense that they will be much too expensive to be burned. Therefore, a shift to 100% renewable energy has to happen within about a hundred years. The vitally important point is that if the shift does not happen quickly, if we do not leave most of our fossil fuels in the ground instead of burning them, we risk a climatic disaster of enormous proportions, perhaps comparable to the Permian-Triassic thermal maximum, during which 70% of terrestrial vertebrates and 93% of marine species became extinct. Thus the shift must happen, and will happen. But we must work with dedication, and a sense of urgency, to make it happen soon. 4. What are the Forms of Renewable Energy? The main forms of renewable energy now in use are wind power, hydropower, solar energy, biomass, biofuel, geothermal energy and marine energy. In addition, there are a number of new technologies under development, such as artificial photosynthesis, cellulosic ethanol, and hydrogenation of CO2. At present, the average global rate of use of primary energy is roughly 2 kilowatts per person. In North America, the rate is 12 kilowatts per capita, while in Europe, the figure is 6 kilowatts. In Bangladesh, it is only 0.2 kilowatts. This wide variation implies that considerable energy savings are possible, through changes in lifestyle, and through energy efficiency. Biomass, wind energy, hydropower and wave power derive their energy indirectly from the sun, but in addition, various methods are available for utilizing the power of sunlight directly. These include photovoltaic panels, solar designs in architecture, solar systems for heating water and cooking, concentrating photovoltaic systems, and solar thermal power plants. Solar photovoltaic cells are thin coated wafers of a semiconducting material (usually silicon). The coatings on the two sides are respectively charge donors and charge acceptors. Cells of this type are capable of trapping solar energy and converting it into direct-current electricity. The electricity generated in this way can be used directly (as it is, for example, in pocket calculators) or it can be fed into a general power grid. Alternatively it can be used to split water into hydrogen and oxygen. The gases can then be compressed and stored, or exported for later use in fuel cells. In the future, we may see solar photovoltaic arrays in sun-rich desert areas producing hydrogen as an export product. The cost of manufacturing photovoltaic cells is currently falling at the rate of 3-5% per year. The cost in 2006 was $4.50 per peak Watt. Usually photovoltaic panels are warranted for a life of 20 years, but they are commonly still operational after 30 years or more. The cost of photovoltaic electricity is today 2-5 times the cost of electricity generated from fossil fuels, but photovoltaic costs are falling rapidly, while the costs of fossil fuels are rising equally rapidly. Concentrating photovoltaic systems are able to lower costs still further by combining silicon solar cells with reflectors that concentrate the sun’s rays. The most inexpensive type of concentrating reflector consists of a flat piece of aluminum-covered plastic material bent into a curved shape along one of its dimensions, forming a trough-shaped surface. (Something like this shape results when we hold a piece of paper at the top and bottom with our two hands, allowing the center to sag.) The axis of the reflector can be oriented so that it points towards the North Star. A photovoltaic array placed along the focal line will then receive concentrated sunlight throughout the day. Photovoltaic effciency is defined as the ratio of the electrical power produced by a cell to the solar power striking its surface. For commercially available cells today, this ratio is between 9% and 14%. If we assume 5 hours of bright sunlight per day, this means that a photocell in a desert area near the equator (where 1 kW/m2 of peak solar power reaches the earth’s surface) can produce electrical energy at the average rate of 20-30 We/m2, the average being taken over an entire day and night. (The subscript e means “in the form of electricity”. Energy in the form of heat is denoted by the subscript t, meaning “thermal”.) Thus the potential power per unit area for photovoltaic systems is far greater than for biomass. However, the mix of renewable energy sources most suitable for a particular country depends on many factors. Wind parks in favorable locations, using modern wind turbines, are able to generate 10 MWe/km2 or 10 We/m2. Often wind farms are placed in offshore locations. When they are on land, the area between the turbines can be utilized for other purposes, for example for pasturage. For a country like Denmark, with good wind potential but cloudy skies, wind turbines can be expected to play a more important future role than photovoltaics. Denmark is already a world leader both in manufacturing and in using wind turbines. The use of wind power is currently growing at the rate of 38% per year. In the United States, it is the fastest-growing form of electricity generation. The location of wind parks is important, since the energy obtainable from wind is proportional to the cube of the wind velocity. We can understand this cubic relationship by remembering that the kinetic energy of a moving object is proportional to the square of its velocity multiplied by the mass. Since the mass of air moving past a wind turbine is proportional to the wind velocity, the result is the cubic relationship just mentioned. Before the decision is made to locate a wind park in a particular place, the wind velocity is usually carefully measured and recorded over an entire year. For locations on land, mountain passes are often very favorable locations, since wind velocities increase with altitude, and since the wind is concentrated in the passes by the mountain barrier. Other favorable locations include shorelines and offshore locations on sand bars. This is because onshore winds result when warm air rising from land heated by the sun is replaced by cool marine air. Depending on the season, the situation may be reversed at night, and an offshore wind may be produced if the water is warmer than the land. The cost of wind-generated electrical power is currently lower than the cost of electricity generated by burning fossil fuels. The “energy payback ratio” of a power installation is defined as the ratio of the energy produced by the installation over its lifetime, divided by the energy required to manufacture, construct, operate and decommission the installation. For wind turbines, this ratio is 17:39, compared with 11 for coal-burning plants. The construction energy of a wind turbine is usually paid back within three months. Biomass is defined as any energy source based on biological materials produced by photosynthesis - for example wood, sugar beets, rapeseed oil, crop wastes, dung, urban organic wastes, processed sewage, etc. Using biomass for energy does not result in the net emission of CO2, since the CO2 released by burning the material is already absorbed from the atmosphere during photosynthesis. If the biological material had decayed instead of being burned, it would have released the same amount of CO2 as in the burning process. Miscanthus is a grassy plant found in Asia and Africa. Some forms also grow in Northern Europe, and it is being considered as an energy crop in the United Kingdom. Miscanthus can produce up to 18 dry tons per hectare-year, and it has the great advantage that it can be cultivated using ordinary farm machinery. The woody stems are very suitable for burning, since their water content is low (20-30%). Jatropha is a fast-growing woody shrub about 4 feet in height, whose seeds can be used to produce diesel oil at the cost of about $43 per barrel. The advantage of Jatropha is that it is a hardy plant, requiring very little fertilizer and water. It has a life of roughly 50 years, and can grow on wasteland that is unsuitable for other crops. The Indian State Railway has planted 7.5 million Jatropha shrubs beside its right of way. The oil harvested from these plants is used to fuel the trains. For some southerly countries, honge oil, derived from the plant Pongamia pinnata may prove to be a promising source of biomass energy. Studies conducted by Dr. Udishi Shrinivasa at the Indian Institute of Sciences in Bangalore indicate that honge oil can be produced at the cost of $150 per ton. This price is quite competitive when compared with other potential fuel oils. Recent studies have also focused on a species of algae that has an oil content of up to 50%. Algae can be grown in desert areas, where cloud cover is minimal. Farm waste and excess CO2 from factories can be used to speed the growth of the algae. It is possible that in the future, scientists will be able to create new species of algae that use the sun’s energy to generate hydrogen gas. If this proves to be possible, the hydrogen gas may then be used to generate electricity in fuel cells, as will be discussed below in the section on hydrogen technology. Promising research along this line is already in progress at the University of California, Berkeley. Biogas is defined as the mixture of gases produced by the anaerobic digestion of organic matter. This gas, which is rich in methane (CH4), is produced in swamps and landfills, and in the treatment of organic wastes from farms and cities. The use of biogas as a fuel is important not only because it is a valuable energy source, but also because methane is a potent greenhouse gas, which should not be allowed to reach the atmosphere. Biogas produced from farm wastes can be used locally on the farm, for cooking and heating, etc. When biogas has been sufficiently cleaned so that it can be distributed in a pipeline, it is known as “renewable natural gas”. It may then be distributed in the natural gas grid, or it can be compressed and used in internal combustion engines. Renewable natural gas can also be used in fuel cells, as will be discussed below in the section on Hydrogen Technology. Biofuels are often classified according to their generation. Those that can be used alternatively as food are called first-generation biofuels. By contrast, biofuels of the second generation are those that make use of crop residues or other cellulose-rich materials. Cellulose molecules are long chains of sugars, and by breaking the inter-sugar bonds in the chain using enzymes or other methods, the sugars can be freed for use in fermentation. In this way lignocellulosic ethanol is produced. The oil-producing and hydrogen-producing algae mentioned above are examples of third-generation biofuels. We should notice that growing biofuels locally (even first-generation ones) may be of great benefit to smallholders in developing countries, since they can achieve local energy self-reliance in this way. The ultimate source of geothermal energy is the decay of radioactive nuclei in the interior of the earth. Because of the heat produced by this radioactive decay, the temperature of the earth’s core is 4300 degrees C. The inner core is composed of solid iron, while the outer core consists of molten iron and sulfur compounds. Above the core is the mantle, which consists of a viscous liquid containing compounds of magnesium, iron, aluminum, silicon and oxygen. The temperature of the mantle gradually decreases from 3700 degrees C near the core to 1000 degrees C near the crust. The crust of the earth consists of relatively light solid rocks and it varies in thickness from 5 to 70 km. The outward flow of heat from radioactive decay produces convection currents in the interior of the earth. These convection currents, interacting with the earth’s rotation, produce patterns of flow similar to the trade winds of the atmosphere. One result of the currents of molten conducting material in the interior of the earth is the earth’s magnetic field. The crust is divided into large sections called “tectonic plates”, and the currents of molten material in the interior of the earth also drag the plates into collision with each other. At the boundaries, where the plates collide or split apart, volcanic activity occurs. Volcanic regions near the tectonic plate boundaries are the best sites for collection of geothermal energy. The entire Pacific Ocean is ringed by regions of volcanic and earthquake activity, the so-called Ring of Fire. This ring extends from Tierra del Fuego at the southernmost tip of South America, northward along the western coasts of both South America and North America to Alaska. The ring then crosses the Pacific at the line formed by the Aleutian Islands, and it reaches the Kamchatka Peninsula in Russia. From there it extends southward along the Kuril Island chain and across Japan to the Philippine Islands, Indonesia and New Zealand. Many of the islands of the Pacific are volcanic in nature. Another important region of volcanic activity extends northward along the Rift Valley of Africa to Turkey, Greece and Italy. In the Central Atlantic region, two tectonic plates are splitting apart, thus producing the volcanic activity of Iceland. All of these regions are very favorable for the collection of geothermal power. Electrolysis of water to produce hydrogen gas has been proposed as a method for energy storage in a future renewable energy system. For example, it might be used to store energy generated by photovoltaics in desert areas of the world. Compressed hydrogen gas could then be transported to other regions and used in fuel cells. Electrolysis of water and storage of hydrogen could also be used to solve the problem of intermittency associated with wind energy or solar energy. The arrangement of a hydrogen fuel cell is such that the hydrogen cannot react directly with the oxygen, releasing heat. Instead, two half reactions take place, one at each electrode, as was just mentioned in connection with the electrolysis of water. In a hydrogen fuel cell, hydrogen gas produces electrons and hydrogen H+ ions at one of the electrodes. The electrons flow through the external circuit to the oxygen electrode while the hydrogen ions complete the circuit by flowing through the interior of the cell (from which the hydrogen and oxygen molecules are excluded by semipermeable membranes) to the oxygen electrode. Here the electrons react with oxygen molecules and H+ ions to form water. In this process, a large part of the chemical energy of the reaction becomes available as electrical power. The theoretical maximum efficiency of a heat engine operating between a cold reservoir at temperature TC and a hot reservoir at TH is 1-TC/TH , where the temperatures are expressed on the Kelvin scale. Since fuel cells are not heat engines, their theoretical maximum efficiency is not limited in this way. Thus it can be much more efficient to generate electricity by making hydrogen and oxygen react in a fuel cell than it would be to burn the hydrogen in a heat engine and then use the power of the engine to drive a generator. Hydrogen technologies are still at an experimental stage. Furthermore, they do not offer us a source of renewable energy, but only means for storage, transportation and utilization of energy derived from other sources. Nevertheless, it seems likely that hydrogen technologies will have great importance in the future. In our present situation, a rapid shift to renewable energy could present the world with many benefits. Ecological constraints and depletion of natural resources mean that industrial growth will very soon no longer be possible. Thus we will be threatened with economic recession and unemployment. A rapid shift to renewable energy could provide the needed jobs to replace lost jobs in (for example) automobile production. Renewable energy is becoming competitive with fossil fuels, and thus it represents a huge investment opportunity. These considerations point to a fight that will have to be fought by the people of the world who are concerned about the long-term future of human civilization and the biosphere, against the vested interests of our oligarchic rulers. This fight will require wide public discussion of the dangers of runaway climate change. But at present, our corporate-controlled mass media refuse to touch the subject. Many traditional agricultural societies have an ethical code that requires them to preserve the fertility of the land for future generations. This recognition of a duty towards the distant future is in strong contrast to the short-sightedness of modern economists. For example, John Maynard Keynes has been quoted as saying “In the long run, we will all be dead”, meaning that we need not look that far ahead. By contrast, members of traditional societies recognize that their duties extend far into the distant future, since their descendants will still be alive. In some parts of Africa, a man who plans to cut down a tree offers a prayer of apology, telling the tree why necessity has forced him to harm it. This preindustrial attitude is something from which industrialized countries could learn. In industrial societies, land “belongs” to someone, and the owner has the “right” to ruin the land or to kill the communities of creatures living on it, if this happens to give some economic advantage, in much the same way that a Roman slave-owner was thought to have the “right” to kill his slaves. Preindustrial societies have a much less rapacious and much more custodial attitude towards the land and its non-human inhabitants. Contrast this expression of the deep ethical convictions of the world’s people with the cynical, money-centered results of various intergovernmental conferences on climate change! Our economic system is built on the premise that individuals act out of self-interest, and as things are today, they do so with a vengeance. There is no place in the system for thoughts about the environment and the long-term future. All that matters is the bottom line. The machine moves on relentlessly, exhausting non-renewable resources, turning fertile land into deserts, driving animal species into extinction, felling the last of the world’s tropical rainforests, pumping greenhouse gases into the atmosphere, and sponsoring TV programs that deny the reality of climate change, or other programs that extol the concept of never-ending industrial growth. But the economists, bankers, bribed politicians and corporation chiefs who destroy the earth today, are destroying the future for their own children, grandchildren and great-grandchildren. Does it make sense for them to saw off the branch on which they, like all of us, are sitting? Must there be a human-initiated 6th geological extinction event? Is it inevitable that the long-term future will witness the disappearance of human civilization and most of the plants and animals that are alive today? No! Absolutely not! It is only inevitable if we persist in our greed and folly. It is only inevitable if we continue to value money more than nature. It is only inevitable if we are afraid to question the authority of corrupt politicians. It is only inevitable if we fail to cooperate globally, and if we fail to develop a new economic system with both a social conscience and an ecological conscience. We are living today in a time of acute crisis. We need to act with a sense of urgency never before experienced. We need to have great courage to meet an unprecedented challenge. We need to fulfill our duty to future generations.